Every year, people spend million of dollars in getting that perfect tattoo body art, yet, many still struggle on choosing the right fonts to be inked with. In recent times, tattoo-style typography has made a huge impact on all areas of design, starting from graphic design and illustration to web and app design and beyond. So, if you are working on a project for a tattoo fonts studio or trying to create a special logo or design, the below-described tattoo fonts will definitely spur you on. 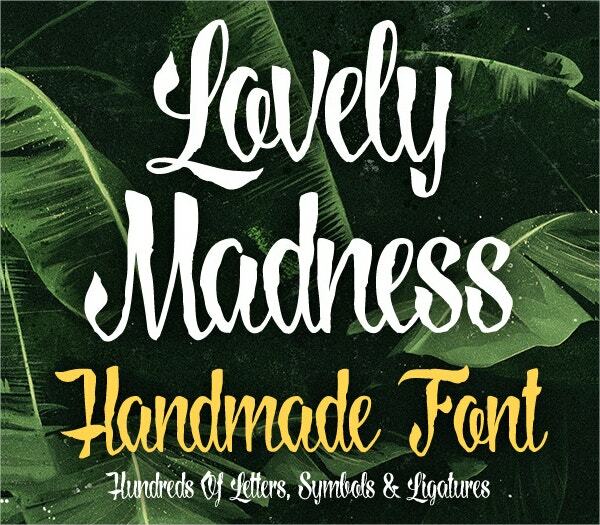 Lovely madness is a calligraphy font and it is a combination of various types of calligraphy-based fonts. We don’t see hand-written calligraphy being used too often these days. So using this Lovely madness font in your tattoo designs will definitely give them a unique look. Captain Cook Tattoo Font has been named after the famous voyager, Captain James Cook who encountered many tattooed people during many of his voyages to the Pacific Ocean. 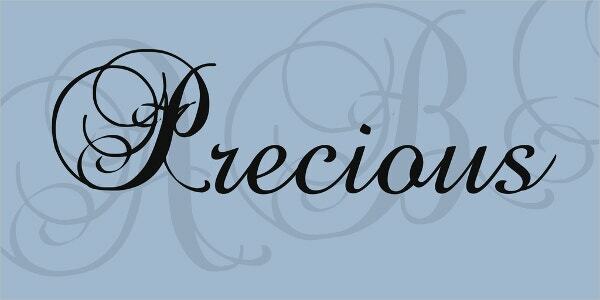 It is a basic decorative font wherein you will see the upper case as an outline and the lower case, semi-filled. It also comes with many symbols and numbers which make it appropriate for tattoo designing. It is best used in 36pt or higher and it’s best suited for personal designs, branding, and promotional artwork. 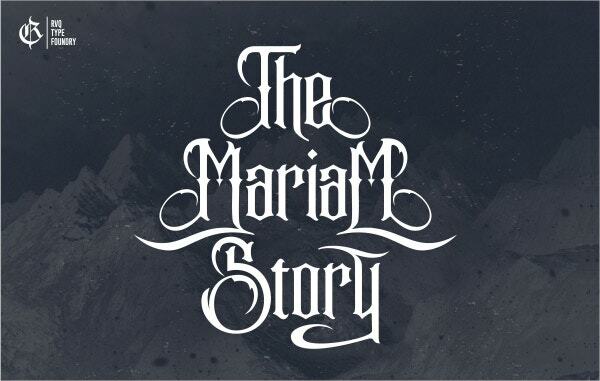 The Mariam Story font is designed by Rvq Typefoundry and it contains an elegant and vintage character set. The Mariam Story font can be used for creating awesome tattoo designs. You can mix the uppercase and lowercase characters and use it with different symbols to create your own unique tattoo art. It can also be used for many creative products and designs. This Tattoo Script font has a cheeky touch of graffiti to it, which makes it suitable for a variety of tattoo designs. It was inspired from tattoo lettering with swirl tattoos. Tattoo Script font can be used in uppercase, lowercase, numeric and symbol designs. Precious Fonts is designed by BoltCutterDesign and it is a traditional, calligraphy-inspired tattoo font that can be used for various tattoo art related projects. It is available in TTF format. 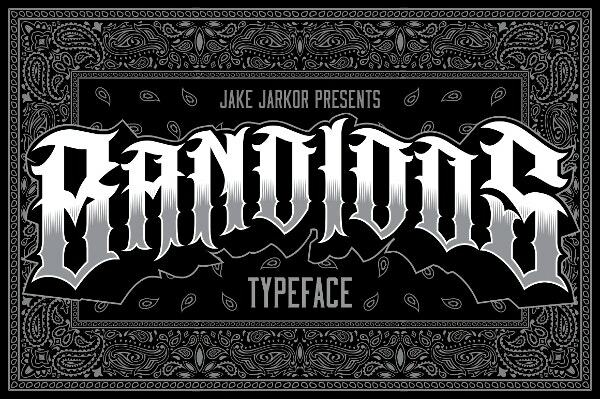 Bandidos font is designed by Jake Jarkor and it is a typeface inspired by tattoo letters, Chicano culture and street art. It works well with both normal and larger text types and the use of single character in design, makes it suitable for tattoo styling. It can be used for many creative products like tattoo designs, t-shirt print design, etc. 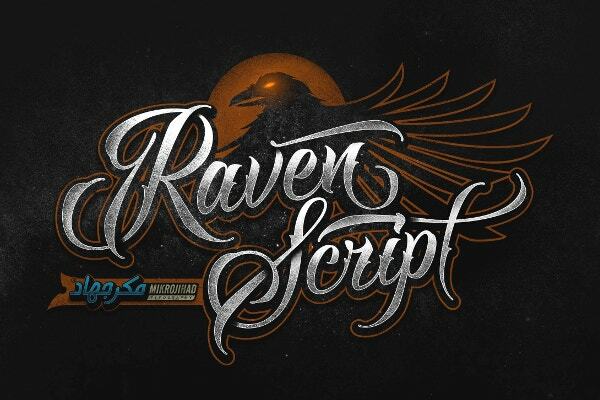 Raven Script Demo Font is created by Mikrojihad Font. It is a great fit for projects such as tattoo design, logo design, poster design and many others. This font is built with Opentype technology. So, to access all the alternate characters from this font, it is recommended to use this font with Opentype support software or third party applications such as Windows Character map or Babelmap for Windows OS. 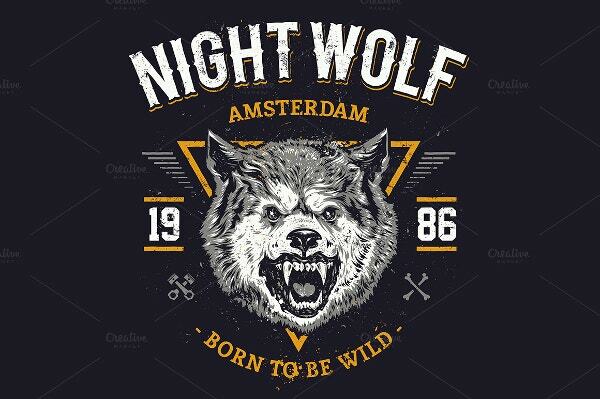 Night Wolf + Bonus font is designed by Vecster. It contains a highly detailed drawing of a wolf’s head and is apt for those who want to opt for such themed tattoo designs. You can easily edit, resize and recolor this design as per your preference using Adobe Illustrator. You will love the bold strokes of this decorative font from Aerotype. The Keepsake Family has five fonts that can be combined to provide a wide range of creative options. It has both uppercase and lowercase letter types. All five fonts support Latin, Eastern European, and Baltic Languages. It also contains four decorative elements which will assist greatly in your tattoo design. 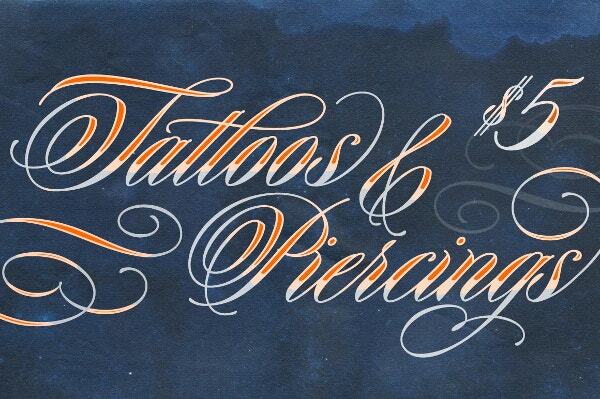 AZ Sailor Tattoo font is designed by Andre Zottolo. It was inspired by pre-WW2 tattoos. The font utilizes an old look to the line work which provides a worn out look to it. AZ Sailor Tattoo font is very popular among tattoo designers and it can also be used as a headline or sub-head text in your design. Tattoo fonts are not very common in designs, however, if you use these tattoo fonts properly in your various types of designs like logos, web design, prints etc, they can give your designs a unique look and feel. It will definitely help you in creating that impact that you might be hoping for, from your designs. 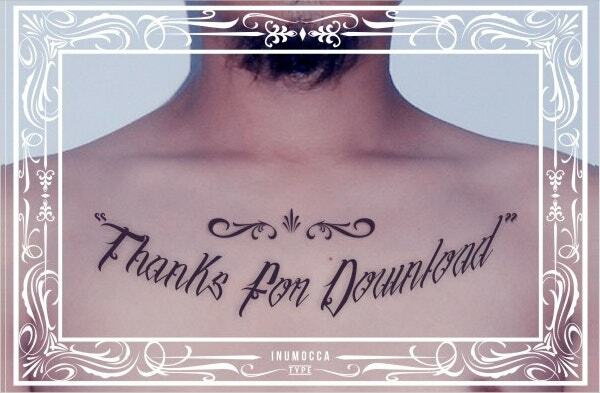 You can also see Best Script Tattoo Fonts.